MAGIC PCO coated surfaces have unique properties. They clean themselves, they are antibacterial and they are even able to eliminate pollutants, viruses and unpleasant odours from our air. Photocatalysis based on titanium dioxide has come a long way from the laboratories and is now a part of our everyday life. MAGIC PCO COAT’S are opening up completely new and unexpected opportunities to us. Our MAGIC PCO technology is safe, certified and completely environmentally friendly. Magic PCO Coatings are opening up completely new and unexpected opportunities to us. Thus, serious scientific studies show that approximately 1,000 m² of coated facades clean our air as effectively as 70 large deciduous trees. Therefore a decision for Magic PCO , in addition to its economic aspects, is also a decision for active environmental protection. Our PCO coating technology is safe, and completely environmentally friendly. At the same time, titanium dioxide is completely nonhazardous and food safe. It is already found in many branches of industry as well as in medical and cosmetic applications..
Light has amazing properties regardless of whether it is artificial or natural. Photosynthesis makes life possible from light and air because life-enabling oxygen comes from carbon dioxide. 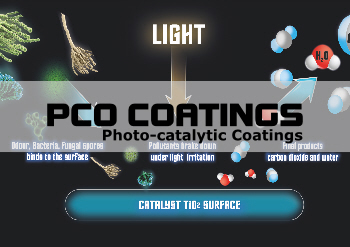 Light and oxygen play an important role in photocatalysis, too. Titanium dioxide can activate oxygen and enable many types of microorganisms to be broken up. As viruses, germs and bacteria are broken up, photocatalysis contributes to an improvement of our quality of life. Magic PCO Coating Technology can be used wherever cleanliness is the measure of all things, wherever unwanted odours occur as well as wherever cleaning is expensive and cumbersome. Advanced Germicidal Nano Coating for Textiles Magic Zn-T Coat - Permanent functional nano coating..